Once in a Blue Moon this is your opportunity for that memorable vacation getaway. 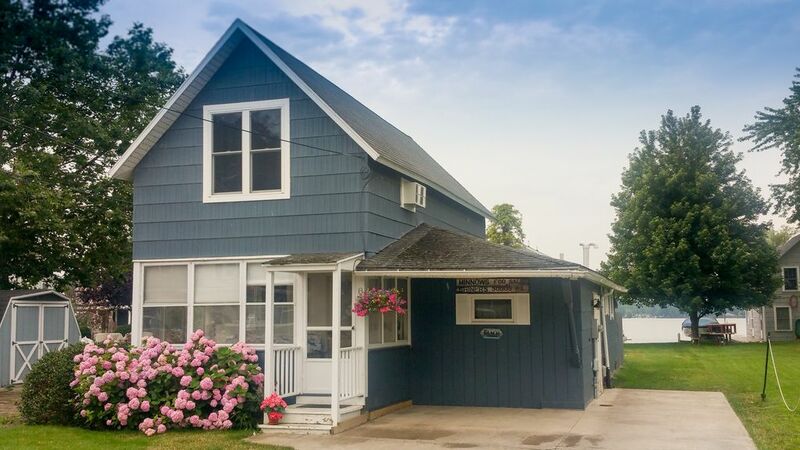 This well appointed and renovated cottage in the heart of this quaint waterfront village is only a leisurely walk to everything you need for your family's relaxation and enjoyment. Recreation choices are limitless. Relax on the water's edge, fish off the dock, private dockage for up to 27', walk to restaurants, enjoy live music, charter fishing, shops, beach, historic sites, boat rentals or just do nothing at all. Enjoy this truly unique single family home as if you never left yours, even bring your pets. All kitchen amenities and plenty of space inside and out for family gatherings or just quiet times together. Two bedrooms are located upstairs, one with a queen bed and water view and the other with 5 twin beds. Downstairs there is a queen sized sleeper sofa in the living room as well as a full size futon on the enclosed porch. There is a recently renovated main bathroom downstairs with dual vanities and stall shower and a brand new powder room for additional convenience. Beautifully maintained cottage sleeps 7+! This cottage is the perfect spot for a family vacation in Sodus Point, NY. The property is beautifully maintained with all the comforts of home - bed linens, 1.5 baths, laundry facility, full kitchen, deck, grill, view of the water (though not right on the water), and GREAT air conditioning in all rooms! Impeccably decorated. Close to the downtown. Nearest full grocery store is about 8 miles. Gail is great to work with! Aside from the most generous owners, this place was incredible. The amenities made the stay easy going and convenient. The house itself was very clean and accommodating. The appliances are updated and easy to use. The yard is spectacular for entertainment, fires, playing games etc. We will definitely be renting from here again next year! I can not say enough how wonderful Blue Moon Cottage is. Myself, my daughter and my son stayed here and would do it again in a heartbeat. If you want comfort and relaxation this is the place to do it. Besides the fishing which is amazing and being able to walk to local establishments, it is a great location and would rent again. This house was amazing and had lots of character. The back view was breathtaking (water with dock, big yard, huge deck with outside furniture). This house was also fully equipped (Sheets, Kitchen Appliances, Hygiene Products, Towels, Washer/Dryer) basically anything you can think of. The cottage was extremely clean and spacious. Me and my family defiantly will come back. I recommend this cottage to anyone looking to relax and enjoy themselves. The owners were very helpful and very friendly. The Blue Moom Cottage was the perfect rental for my girls trip, beginning with a very easy check in process and being greated by the lovely owners. The cottage is located right on water with a beautiful view and dock. It easily accomadated for 9 of us girls and the two bathrooms were great. I left my hair dryer behind and the owners had a guest one for us to use along with toiletries. Let's not forget the fully stocked kitchen with anything we would need form a coffee maker to pots pans, wine glasses and so much more. We enjoyed the beautiful deck and grill for dinner and then a 4 minute walk to the bars where great bands played made for the best girls weekend !!! After a long drive in from out of state we arrived late to lights on, the heat up and fresh flowers (nice touch)! Up early the next morning for a long day of fishing. Glad to get back to shore to a cozy cottage and a hot shower before walking to a local restaurant for a good meal. Very comfortable and quiet for a good night sleep then up early to get back on the water. At the end of another good day of fishing, took advantage of the fully equipped kitchen and outdoor grill and enjoyed relaxing on the deck before the drive home. Great place! Short drive to the renowned Finger Lakes Wine Region.